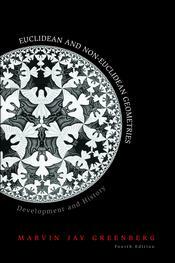 This is the definitive presentation of the history, development and philosophical significance of non-Euclidean geometry as well as of the rigorous foundations for it and for elementary Euclidean geometry, essentially according to Hilbert. Appropriate for liberal arts students, prospective high school teachers, math. majors, and even bright high school students. The first eight chapters are mostly accessible to any educated reader; the last two chapters and the two appendices contain more advanced material, such as the classification of motions, hyperbolic trigonometry, hyperbolic constructions, classification of Hilbert planes and an introduction to Riemannian geometry.